Check out the new blog title image. Do you like it? Whooo! I finally found a dressmaker! It's been a long and arderous journey, but I'm glad its over (almost). My friend Natalie and I actually searched all over the Boston area for a dressmaker. But each time the cons outweighed the pros. One place only took your measurements and sent them to Vietnam where they actually made the dress. Other places did not give you any wiggle room for customization other than fabric. We did find one place in Boston that allowed for customization, but the reviews for that vendor were horrendous. Natalie's mom also had a not so great meeting with the shop owner so that swayed my decision not to use them. I didn't think my original design would be all that hard to make if one started with a commercial pattner. So on a whim, I started searching Craigslist for seamstress/dressmaker/fashion students looking for work. At first I didn't find anything. I tried again a few weeks later. I told myself that it would be my last attempt. If I didn't find anything, I'd just save my money and not have a second dress. Well, the moons must have been aligned just right, because I found Barbara of Anchorage Nine. She had just moved her business from San Fransisco to Somerville and was trying to spread the word. After a couple of emails back and forth, I knew she was the one for the job. I fell in love with this next dress a long time ago. I loved it so much that I found out what pattern was used and my friend bought the pattern to make the dress for me. I was thinking that it could either be my rehearsal dress or reception dress. But life happens, she had her second baby and sewing is on her back burner. Anyways, I loved the skirt and thought it was perfect. It is very "me". Now﻿﻿﻿ combine the skirt with the open neckline design, change the collar, and wah-la: my dress! Barbara took about 18 million measurements (ok, just 18) a couple of weeks ago and will be starting on the muslin. The muslin is the mock up of the dress using a cheap fabric. It should be finished before Christmas. I brought up the concept of "yay" flags a couple of months back. Well, they have come to fruition much sooner than I thought. I decided to make them for my wedding cohort of Young(s) and in Love; an early wedding present if you will. In trying to be a good blogger, that or just to document the process so that I can possibly repeat the project, I took pictures along the way. Step 1: Purchase premade canvas flags from Oriental Trading Co. Step 2a: Upon receiving flags, remove wooden dowels and iron fabric flat. Step 2b: Outsource dowel modification to friends with wood working experience. Big thanks the A. and C.! The dowels are sharpened at one end, like a skewer. For safety reasons, I choose to have it filed down. Step 3: Size and print out design on paper. Step 4: Trace design onto plastic stencil. Blank stencil plastic was purchased from Michaels. Step 5: Cut out design with exacto knife. Step 6: Mess up and repeat steps 2 and 3. Step 9: Dip end of dowel in glue (Elmer's is fine), you just need a dab. Insert dowel into flag and let dry. Step 10: Say "YAY" and wave them around! I could copy Mrs. Hot Wings, but I don't want to. I don't want to have my photos exposed to the elements. Who know's what will happen to them after people throw back a couple of drinks. Even then, food can accidentally get on them, you know. I would want to protect my pictures! Luckily for me, Ikea has other options. Plastic or Wood. I could go with Nyttja frames or the tried and true Ribba frames (which I already own). The Nyttja frames are plastic with a sheet of plastic. If I go with the smaller one's, 4x6, they're only $0.50 more than the Tolsby's and I can definitely reuse them in our home. But my idea was to have a little bit of matting around the picture so that I had room to place the table number. Definitely doable, but I would need to go up a size and buy/make the matting. 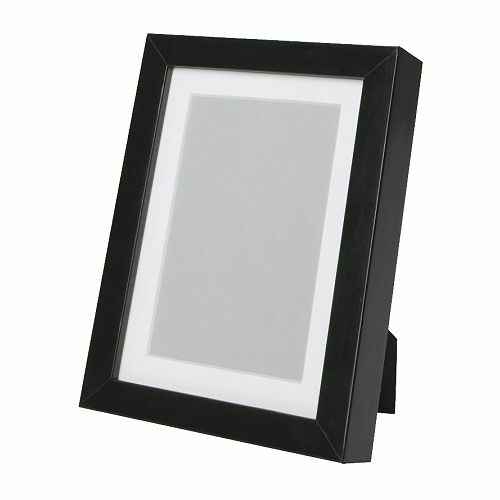 Ribba frames are wood with sheet of glass and come pre-matted. The down side is that they're a bit more spendy, 3x the Tolsby for the 5x7's. I also can't seem to find the 4x6 frames online, but I swear that I have one at home. Guess I need to make a trip down to Ikea. Yay for another project designed and logistics [almost] figured out. And now you know how I overthink the littlest details. Holy crap-a-moley. I know, I know, I say that every month as we count down, but wowzas, time is trucking along. I am happy to report that we moving on things [slowly]. I almost feel like we're taking care of the little things first, rather than the big ticket items first. What can I say, we're unconventional and like to do things on our own pace. I have my wedding gown - I have it in my closet!!! We are starting to look at caterers! Pirate golf, gators, and sunset! The time before last, I briefly mentioned our adventures in getting to our photo shoot. Of course I went on and on about how worried I was that our pictures wouldn't come out. I've stopped fretting, partially because there's nothing I can do about it at this point, partially because Jake said that we could go back to Florida and redo our pictures if they didn't come out, but mostly because our pictures are READY!!!!! *click-thump-clack* That was the sound of my jaw hitting the keyboard when I saw our pictures for the first time!!!! It was then followed by a string of OMGs, many Wows, and a couple of Holy craps. They didn't just make me smile, I was grinning from ear to ear and all sorts of giggly. The photos are AMAZING, WONDERFUL, and PERFECT. They're exactly what we were going for: fun, candid, modern, and artistic. Want to see what our friends are saying about them? capture so that I could share the love with our photog. ﻿﻿﻿﻿One week turn around time, can you believe that? Jason's wife, Lucia, is amaze-balls! Not only did she have all of our photos lightly edited, posted for viewing, she also had a really cute (and long) blog post ready for us. Seriously, it can't get any better. Oh well, it can, just look at the photos! I can't stop sharing these. I also can't stop grinning. I also can't stop looking at them. OK, enough suspense. Go here for the blog post: Celia and Jakes Engagement Session. If you want to see the entire album, just let Jake or myself know. Jason is amazing and a blast to work with, it felt more like we were all just hanging out. I think the two of them are magicians who's medium is photos! How do you like the new and improved look of the blog? I thought the colors I previously had up were a little dark. We're not shooting for a gothic look or feel. I also noticed that the font was a touch hard to read on each of the post titles. Hopefully this cleans things up, brightens it with just a touch of color here and there. Although, it's feeling a bit sterile now. I'll have a new title once we get picture back from our engagement session; they're saying sometime this week! *This is a dual post between this blog and my other blog. Our photographer and his family are pretty amazing. I can't tell you how many questions and favors I've asked them over the last year. I'm amazed that they've put up with me, and we're still 9 months away from the wedding. Woah, 9 months! Crap! Anyways, I wanted to thank them. What better way than a tasty treat? How about a tasty treat in the form of their logo? Our photographer is Jason Angelini. Look them up, they're AWESOME! These traveled well. I made them the night before we left to keep them as fresh as possible. Placed them in tupperware to keep them moist (at least that was the hope), frozen them, packed them in ice in a cardboard box, and then placed it in the fridge as soon as we got to FL. I was really worried about the heat and humidity, but as it turned out, Florida was experiencing record low temperatures. So we met with our photographer, Jason of Jason Angelini and rocked our engagement session at a mini golf course, the beach, AND in the middle of a street. But I tossed and turned all night because now I'm worried that our pictures won't come out or that we won't have enough good one's to use as our table numbers. Was the lighting OK? Did we stand still enough for the street shots? I know, I know, I'm sure they're fine and I'm more than positive that he did a fantastic job (as always). But you see, we were 30 minutes late for a session. 30 minutes late before sunset is like racing against time. Why were we late? First we misjudged commuting times. The speed limit is somewhere between 25-35 mph here, we got stuck behind someone that went 25 for most of the stretch, so that was 5 minutes. Then it turns out that we went to the WRONG mini golf place. Stood around for 10 minutes before realizing it was the wrong place. Apparently there are two by the same name on the same stretch of road, 10 minutes apart. *Sigh* What's done is done, all we can do is wait for the final product. Jason at work...I asked for an awesome shoe shot! (personal photo). On a positive note, the wind cooperated with us! The 12 mph winds from Sunday died down to just a breeze. I'll leave you with this teaser, because it's all that I have. Jason started our session off with the Fuji Instax camera! I was so excited that I was tonge tied. I've seen this everywhere in the wedding blogosphere. Originals by Jason Angelini, photo of originals by me. Look closely at the picture in the right. What do you see? Yes, that's a swing, look closer. The squirrel is swinging! What a beautiful campus the Colgate University! This trip was full of many firsts for me: first time riding in a limo (yep, that was the shuttle service to and from the wedding), first time in Rochester, and my first time eating pumpkin bread french toast (OMG, yum). This was also the first wedding we've attended all year in which the ceremony took place in a church. You probably noticed that there aren't any picture of the bride and groom in the collage above. That's because I caught them on video. It was a bittersweet moment for all of us. Tropical storm Nicole ran its way up the NorthEast the day before the wedding. As you can imagine, this wrecked havoc on travel, specifically air travel. We were able to catch our flight from Boston to Rochester after some delay. However, our friends in Denver were not as lucky. There was no way for them to make it to Rochester until after the ceremony. Those of us at the wedding banded together and did our best to document the festivities for them. With my handy dandy point and shoot camera, I tried to capture what I could of the day. Aboard! Next [virtual] stop: Virginia and Indonesia; a shout-out to the weddings we missed.